Before you begin learning new knots, you need to know some of the basic terms used in knot tying. You should become familiar with these terms and use them as you learn how to tie the various knots. Running end and standing part. These are two of the most common terms used in knot tying. The running end is the end of the rope that is used to tie the knot. This end is sometimes referred to as the working end. The rest of the rope is the standing part. Overhand loop. An overhand loop is formed when a loop is made so that the running end of the rope is on top of the standing part. It can be formed anywhere along the standing part of the rope in the same fashion. Underhand loop. And underhand loop is formed when the running end of the rope is placed under the standing part of the rope. Bight. A bight is formed by doubling back a length of the rope against itself to form a U. This can be done with the running end (as shown on the left), or anywhere along the standing part (as shown in the middle). Bights can vary from a few inches to a few feet in length. A bight doesn’t have to have a sharp bend. It can be “open” (as shown on the right). In this case, the running end of the rope is alongside the standing part of the rope, but is not crossed over (which would form and overhand or underhand loop). Take a turn. The term take a turn means to wrap a rope around a spar or stake so it continues off in the same direction. The friction this creates will give you a grip on the stake or spar that will help you hold the strain on the line. It also gives better control in taking up or letting out a line. Roundturn. To make a roundturn, wrap the rope completely around a spar and bring the running end back along the standing part of the rope. A roundturn gives you even more grip in holding the strain on a line, and is the basis for tying several knots, as when making a Roundturn with Two Half Hitches. Bend – A bend is a knot used to join two lengths of rope. Bight – A bight has two meanings in knotting. It can mean either any central part of a rope (between the standing end and the working end) or an arc in a rope that is at least as wide as a semicircle. In either case, a bight is a length of rope that does not cross itself. Knots that can be tied without use of the working end are called knots on the bight. Binding Knot – Binding knots are knots that either constrict a single object or hold two objects snugly together. Whippings, seizings and lashings serve a similar purpose to binding knots, but contain too many wraps to be properly called a knot. In binding knots, the ends of rope are either joined together or tucked under the turns of the knot. Decorative Knot – A decorative knot is any aesthetically pleasing knot. Although it is not necessarily the case, most decorative knots also have practical applications or were derived from other well-known knots. Decorative knotting is one of the oldest and most widely distributed folk art. Dressing – Knot dressing is the process of arranging a knot in such a way as to improve its performance. Crossing or uncrossing the rope in a specific way, depending on the knot, can increase the knot’s strength as well as reduce its jamming potential. Elbow – An elbow refers to any two nearby crossings of a rope. An elbow is created when an additional twist is made in a loop. An example is when tying a Butterfly Knot. Flake – A flake refers to any number of turns in a coiled rope. Likewise, to flake a rope means to coil it. Frap – Fraps are a set of loops coiled perpendicularly around the wraps of a lashing as a means of tightening. Friction Hitch – A friction hitch is a knot that attaches one rope to another in a way that allows the knot’s position to easily be adjusted. Sometimes friction hitches are called slide-and-grip knots. They are often used in climbing applications. Good examples of a friction hitch are the Rolling Hitch and Prusik. Hitch – A hitch is a knot that attaches a rope to some object, often a ring, rail, spar, or post. Jamming – A jamming knot is any knot that becomes very difficult to untie after use. Knots that are resistant to jamming are called non-jamming knots. Lashing – A lashing is an arrangement of rope used to secure two or more items together in a rigid manner. Loop – A loop is one of the fundamental structures used to tie knots. It is a full circle formed by passing the working end of a rope over itself. Loop Knot – A loop knot is the type of knot that forms a fixed loop. It is created either when the end of a rope is fastened to its own standing part or when a loop in the bight of a rope is knotted. Unlike a hitch, a loop knot creates a fixed loop in a rope that maintains its structure regardless of whether or not it is fastened to an object. In other words, a loop knot can be removed from an object without losing its shape. Noose – A noose can refer to any sliding loop in which the loop tightens when pulled.Open Loop – An open loop is a curve in a rope that resembles a semicircle in which the legs are not touching or crossed. The legs of an open loop are brought together narrower than they are in a bight.Seizing – A seizing is a knot that binds two pieces of rope together side by side, normally in order to create a loop. The structure of seizings is similar to that of lashings. Setting – Setting a knot is the process of tightening it. Improper setting can cause certain knots to underperform. Slipped Knot – A slipped knot is any knot that unties when an end is pulled. Thus, tying the slipped form of a knot makes it easier to untie, especially when the knot is prone to jamming. 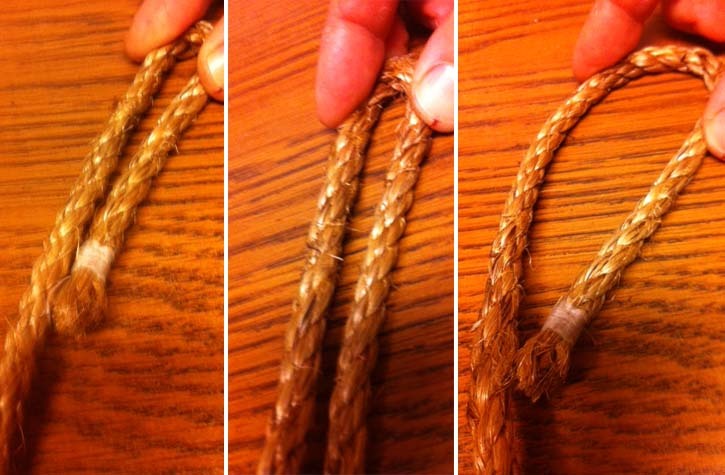 Splice – Splicing rope is a method of joining two ropes done by untwisting and then re-weaving the rope’s strands. Standing End – The standing end (or standing part) of a rope is the part not active in knot tying. It is the part opposite of the working end. Stopper Knot – A stopper knot is the type of knot tied to prevent a rope slipping through a grommet or as a temporary whipping. Whipping – A whipping is a binding knot tied around the end of a rope to prevent the rope from unraveling.